A senior CRPF official said 38 of the jawans were identified while forensic tests were being conducted on two bodies. Sri Nagar/New Delhi: The toll in the terror attack on CRPF personnel in Jammu and Kashmir’s Pulwama district has risen to 40 even as a full Court of Inquiry (CoI) has been ordered by the force headquarters in Delhi, a senior official said Friday. A Jaish suicide bomber Thursday rammed a vehicle carrying about 100-kgs of explosives into a bus carrying CRPF personnel in Pulwama district. “A total of 40 personnel have been killed in Awantipora in Jammu and Kashmir. Five troops are injured,” the senior official said. While 38 personnel have been identified, DNA and forensic tests are being conducted on two bodies, he said. Amongst the killed is a personnel of the CRPF road opening party (ROP) who was tasked to sanitise the highway route for convoy movement, the official said. A Court of Inquiry (CoI) has been ordered into the incident, the official said. “We salute our martyrs of Pulwama attack and stand with the families of our martyr brothers. This heinous attack will be avenged,” the social media post said. The forces’ headquarter in Delhi also issued a list of 36 killed personnel who have been “identified” till now. Central Reserve Police Force (CRPF) Director General R R Bhatnagar and senior officials of the force have left for Kashmir as part of a team led by Union Home Minister Rajnath Singh to assess the situation. They are also expected to meet the injured who are admitted to the 92 base hospital of the Army in Srinagar, they said. More than 2,500 CRPF personnel, many of them returning from leave to rejoin duty in the Valley, were travelling in the convoy of 78 vehicles when they were ambushed on the Srinagar-Jammu Highway at Latoomode in Awantipora in south Kashmir around 3.15 pm on Thursday. The Pakistan-based Jaish-e-Mohammed (JeM) terror group has claimed responsibility for the attack that took place about 20 km from Srinagar, officials had said. 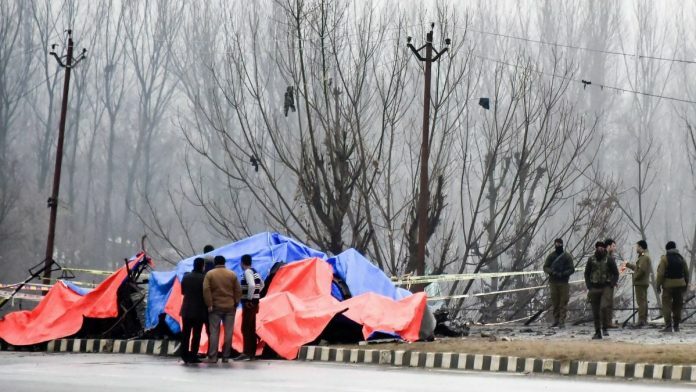 He was driving a vehicle packed with over 100 kg of explosives on the wrong side of the road and hit the bus, in which an estimated 39-44 personnel were travelling, head-on, an official at the spot had said.